DigiCrumbs: Creative Recycling - Plastic Bread Tags! Creative Recycling - Plastic Bread Tags! If you’re like me, you’ll immediately recognize that the object is an ordinary plastic bread tag. You know, the little plastic clip that keeps a bread bag closed. This one was actually from a bag of fresh veggies, but it’s the same plastic tag. When my son spotted this plastic tag lying on the table, he immediately said “Mommy look, Mickey Mouse!” I laughed and would have never noticed that the center actually does have a remarkable resemblance to the silhouette of his favorite cartoon character. I definitely think one of the best parts of being a parent is seeing things through a child’s eyes. 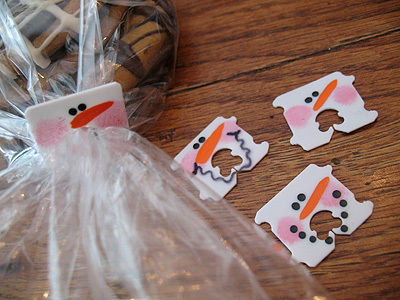 As I was blog hopping, I found this super creative idea for recycling these plastic bread tags over at Crafts by Amanda. 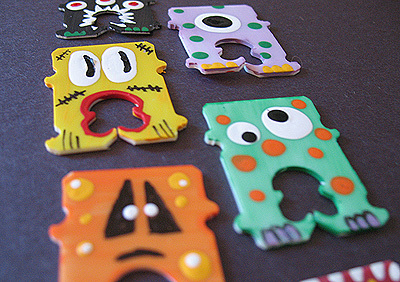 Check out her fun and colorful Recycled Bread Tag Monsters. She also made these adorable Recycled Bread Tag Snowmen. These recycled bread tag creations would be super fun to make with the kids or as a fun surprise, sure to make your family smile when reaching for a bag of bread or veggies! I love that they are creative, one of a kind, recycled, and require little to no cost to create.